This is a great dish to have cooked and ready for the days when you can’t be bothered. Well it is great anytime really! But I often cook them in summer and early autumn. One nice thing about Melbourne’s warmer weather is that, interspersed with really hot days, we have cool changes before the weather heats up again. 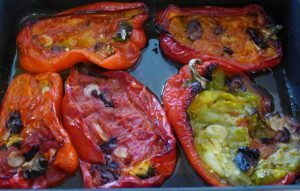 Whenever there is a cool day in a heatwave I cook up a batch of these capsicums and keep them in the fridge for later. They have none of the mess of peeling roasted capsicums and I think they taste better. You just eat them and leave the skin behind or eat them skin and all (I do). They get better with age, with the oil and sugars from the capsicum and tomatoes forming a delicious syrup. I’ve been making this dish for so long, I am not exctly sure where it came from. I think it may have originally been a Delia Smith recipe from the 1980s! I do remember the original had erky anchovies in it, which I replaced with olives for the salty hit. The tomatoes in these were a mix of red, yellow, orange and green striped ones from my garden. I eat mine with some crusty bread for mopping up the juices and a green salad. Cut each capsicum in half lengthways, remove the seeds and membranes, but leave the stems in. Arrange cut side up in the pan so that they are packed in tightly. Using your fingers crush the tomatoes into each capsicum half so that they are almost full. Distribute the garlic and olives between the capsicums. Spoon 2 teaspoons of olive oil into each capsicum and make sure to wipe the cut surfaces of the capsicum with the spoon so they are oiled. Put into the oven to bake until they are soft, collapsing and starting to blacken in spots. This will take around 75 minutes. Check them a couple of times during the cooking and baste the cut edges with some of the filling so it doesn't dry out. Put into a container, sprinkle with basil and refrigerate. Ooh, great simple flavours. Yum!